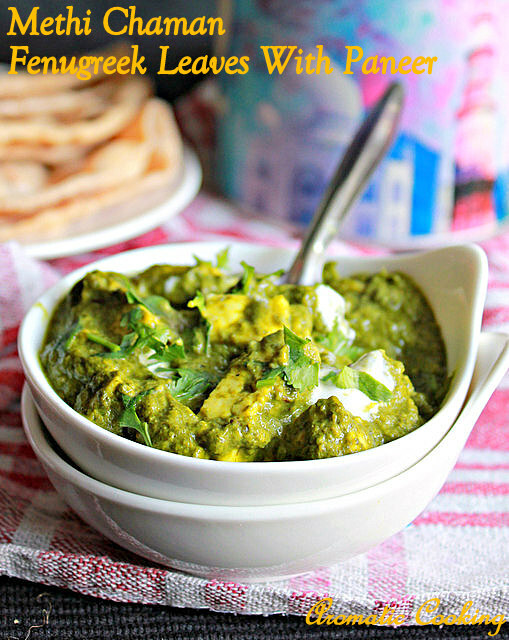 My daughter's favorite side dish for rotis is Palak Paneer and I have two versions of it on the blog. 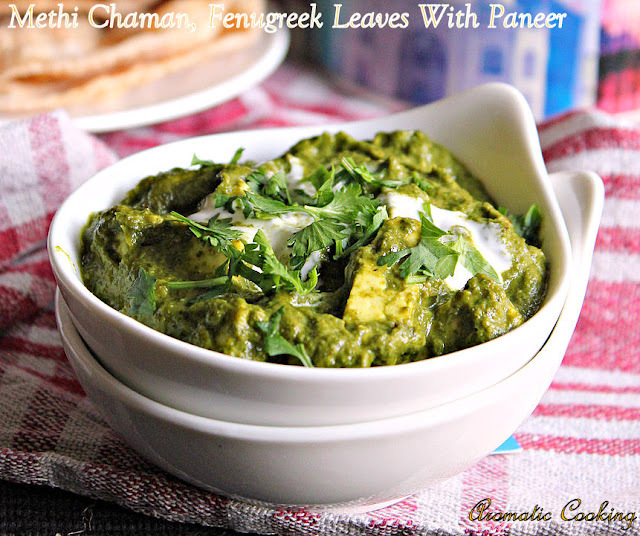 Recently I came across this dish, Methi Chaman and gave it a try, we can call the dish, a cousin to Palak Paneer. We grind and cook a mixture of fresh methi/ fenugreek leaves and spinach and add paneer at the end. 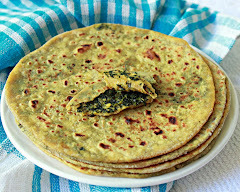 This dish looks similar to Palak Paneer, but the methi gives a wonderful flavor and taste to the dish and it goes very well with rotis, naan and pilafs..
Wash and prepare both the greens and keep. Boil enough water, add both the spinach and methi leaves, once the water starts to boil again, switch off, drain the water and cool the greens. 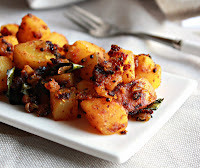 Grind the cooled spinach and methi leaves along with the green chilly and ginger and keep. Heat 3 teaspoons of oil and 2 teaspoons of butter, add the cloves, bay leaf and the caraway seeds. Once the seeds start sizzling, add the ground spinach and methi paste and mix for 2 minutes. 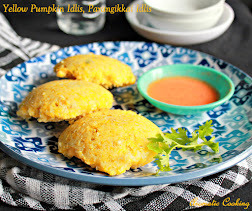 Add the asafoetida, turmeric, chilly, coriander, cumin, dry ginger and garam masala powders along with the sugar and salt. Mix, if too thick, add a little water, cover and cook ( simmer ) for about 10 minutes. 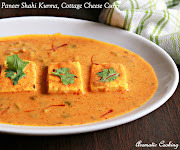 Now add the diced paneer, about 1 cup of water ( used to rinse the blender/mixie), cover and cook for another 10 minutes. Finally add the cream, mix, garnish with the coriander leaves and some more cream and serve. The sugar and cream balances the slight bitterness from the methi. I love methi! Need to get some seeds to grow some too. This looks really appetizing. Wow looks so yumm,and a lovely color! 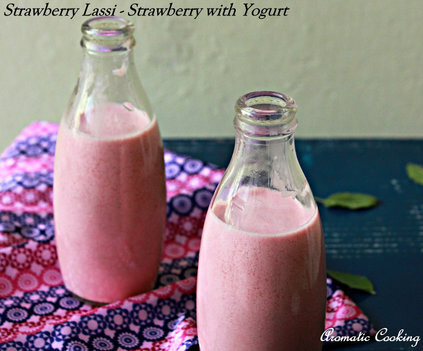 Delectable and creamy recipe! Plus, it is unbelievably healthy. Cannot wait to give it a try!